Feel a great sense of pride as you work your way towards earning a black belt at the United States Academy of Martial Arts. 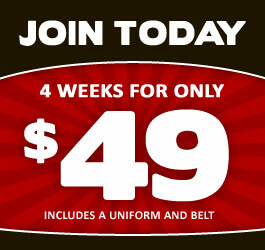 This rewarding journey will introduce you to a unique approach of martial arts instruction. Located in San Luis Obispo, the US-Academy of Martial Arts is unique as we offer two training pathways for students to choose, the Longevity pathway and the Standard pathway. The Longevity Pathway is designed for students who want to learn martial arts but cannot afford even the slightest risk of injury associated with sparring and take-downs. This program involves scripted self-defense training, striking targets and devotes more time to training karate forms. The Standard pathway explores multiple systems of traditional martial arts and includes combative training, forms, striking targets, as well as stand-up sparring and grappling with other students. US-AMA offers a diverse curriculum, exposing each student to a variety of martial arts disciplines from around the world. While our base style is Karate, other great arts such as Aikido, Brazilian Jiu-jitsu, Judo, Kung-Fu and Taekwondo are introduced providing each students with a wealth of knowledge and the ability to have success in a variety of self-defense situations. Most martial arts styles emphasize techniques from one particular range (the distance between opponents). A martial art usually consist of one or two of the following ranges: kicking range (long range), punching range (mid-range), trapping range and grappling range. While most arts touch on all ranges of self-defense, each discipline tends to have one range in which they specialize. The blending of styles provides US-AMA adult students with an unlimited resource of effective self defense techniques. Rather than molding the student into one particular style, US-AMA has designed training programs that maximize the abilities and potential of each student.